A Mitt That Removes Stubborn Contamination Like a Traditional Clay Bar. As every car care enthusiast knows, the key to a brilliant finish lies in the preparation. One of the essential steps in the preparation process is ensuring the car's bodywork is completely free from contamination. Tar, tree sap, brake dust particles and bug remains can bond firmly to paintwork, causing the surface to feel bumpy and uneven to the touch. To achieve a perfectly reflective surface, panels must be smooth as glass. Traditionally, clay bars have been used to shear stubbornly bonded, nubby contamination away from the surface but clay bars, once contaminated, cannot be reused. They must be thrown away to prevent the particles trapped in the clay from causing scratches in the clearcoat. 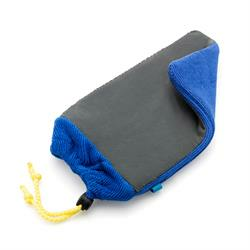 The FLEXIPAD Clay Mitt Blue provides a reusable, fast and easy means of achieving a mirror-smooth finish.